Non-uniform rational B-spline is a mathematical form which is used in computer graphics for 3D generating and representing curves and surfaces. Engineers started to develop NURBS in 1950s. Their aim was to obtain precise mathematical representation of freeform shapes (e.g. hulls, aircraft, spacecraft and cars) with the possibility of copying if necessary. Before NURBS surfaces, designs were drawn as unique samples by hand with various drafting tools. NURBS are not made of grid of rectangles unlike polygons. Splitting of the surfaces into polygons occurs only at the stage of rendering and involves the use of the optimal algorithm to maintain smoothness. That is why smoothness of the surface is observed on the approach. Due to the fact that NURBS surfaces are always smooth and have no sharp corners, they are widely used in organic simulation for generating models of animals, people, cars and other objects. NURBS used to be available only in commercial CAD software products that were intended for automotive productions. Nowadays NURBS is an integral part of Catia, Maya, 3Ds Max, Cinema 4D, Fusion 360, Kompas 3D, Rhinoceros (Rhino), Moment of Inspiration, Alias, SolidWorks and other software products. Reverse engineering of objects with lots of surfaces that change their curvature in accordance with mathematical law is deemed to be more appropriate to perform by using NURBS. The application of this method provides greater accuracy of the result and reduces labour intensity. RangeVision decided to find out whether it is possible to speed up the process of NURBS-based modeling with the use of imported data from Spectrum 3D scanner. The engineers used the sole of sports shoe as the organic surface. The engineers of the company got several tasks. 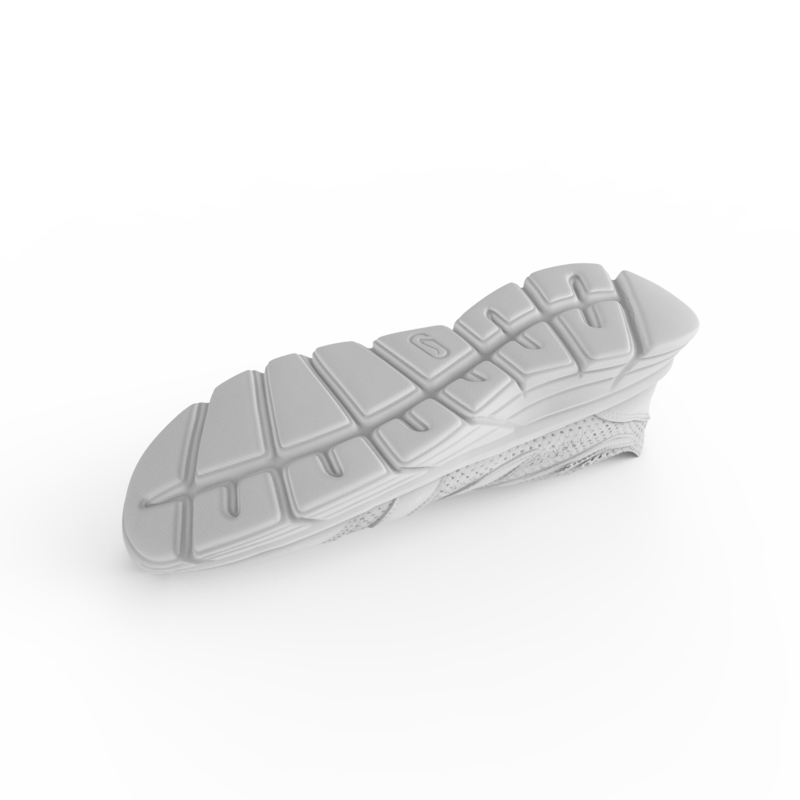 Firstly, it was necessary to perform highly detailed 3D scanning of geometry of the sole. Secondly, the most accurate 3D model was supposed to be generated based on the scanning data. The digitization was performed at RangeVision’s office in the daytime. Specialists placed the sneaker on the turntable and used Spectrum 3D scanner that was set on the second scanning zone for digitization of objects from 30cm to 1m. RangeVision scanned sneaker in two positions and obtained 16 scans (2 groups of 8 scans). Digitization of the object took 25 minutes, post-processing in RangeVision ScanCenter software and obtaining of the final 3D model in .stl format took 35 minutes left. Further work was handed over to RangeVision’s specialist in the field of reverse engineering Dmitry. He started to perform reverse engineering of the sole with the use of NURBS. At first the .stl file was imported to Geomagic Studio software and the coordinate system was generated. Then Dmitry rendered the line to trim the scan and deleted the derived part. The boundary edge was smoothed, and the existing small voids were filled. Defects in the surface were eliminated during the preparation for NURBS-modeling. Digital noise was removed. The mesh was built and edited. It made it possible to design organic surface with the use of NURBS. Dmitry performed the quality control and saved the report once he had set the parameters of accuracy analysis. The final 3D model was exported to .igs format that enables uploading it to any software for further work. In total reverse engineering with the use of NURBS took 4 hours. The task was completed within one working day in comparison with 4 working days which would have been required for generating the same 3D model “from scratch”. The data from Spectrum 3D scanner had high detail that made it possible to perform reverse engineering of the organic surface with the use of NURBS eight times faster than without uploading an .stl file to Geomagic software.